Exercise Physiology: Theory and Application to Fitness and Performance 9 Edition The ninth edition of Exercise Physiology: Theory and Application to Fitness and Performance is intended for students interested in exercise physiology, clinical exercise physiology, human performance, kinesiology/exercise science, physical therapy, and physical education. 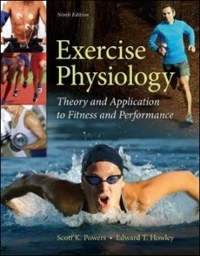 The book contains numerous clinical applications, including exercise tests to evaluate cardiorespiratory fitness and information on exercise training for improvements in health-related physical fitness and sports performance. This comprehensive tool is intended for a one-semester, upper-level undergraduate or beginning graduate exercise physiology course.